Almost ten years ago, the European Space Agency launched a probe with the goal of approaching and studying a comet. The probe was named Rosetta because, just as the Rosetta Stone allowed historians to piece together an ancient language and unlock a great deal of human history, the Rosetta probe will give us a better understanding of comets than we’ve ever had and possibly help us unlock a great deal of our solar system’s history. The ESA invited Long Now to include one of our Rosetta Disks (in early prototype form at the time) on the probe. The Rosetta mission, therefore, serves a second purpose (after its comet research) as an off-world archive of several thousand human languages. In search of its target, Comet 67P/Churyumov-Gerasimenko, Rosetta performed several slingshot fly-bys of our solar system’s inner planets, the last of which happened in 02009. You can upload your video clip and share it with the world via ESA’s dedicated Facebook page. Be creative and imaginative – you can include friends, family, colleagues, members of your team, social clubs, and school groups, or even put together a flash mob to create a memorable video shout. Creators of the two most popular videos will get to watch the Rosetta probe drop a lander named Philae onto the comet from mission control in Germany! Details and how to enter. 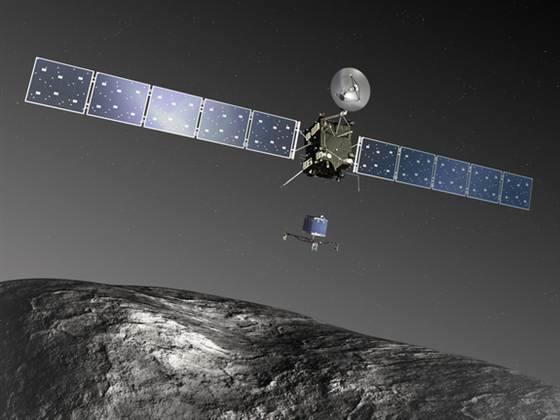 You can keep up with the Rosetta mission on Facebook and Twitter.